In contrast to advertising and publicity, which use impersonal methods of communication, personal selling makes use of direct personal communications to influence the target customers. Personal selling is a highly distinctive method of promotion, and makes use of oral presentation in conversation with existing and potential customers, for the purpose of making a sale. Personal selling, as the name implies, is an individual to individual selling. It, therefore, carries the distinctive advantage of flexibility in terms of tailoring the sales presentation to the needs of the buyer. Another unique advantage comes from its two-way communication, and human interaction thereby providing instant feedback. These two unique advantages make personal selling the most result-oriented promotion method. Generally speaking, the nature of goods marketed, as well as the distribution system adopted, determine the role of personal selling in a firm. Therefore, personal selling is used extensively in the case of industrial goods, where the salesperson performs functions such as assisting the customer in designing the product specifications, product installation, product commissioning, solving technical problems through providing service after sales and helping customer to have optimal utilization of the product. In the case of consumer goods, on the other hand, the role of personal selling gets usually restricted to the dealer level. The scope of the tasks performed include obtaining periodic orders, ensuring supplies, offering tips to dealers on product display and attaining desired levels of stock movement. Similarly, the role played by personal selling is more in a firm which uses door-to-door selling method through its sales force than in the firm which sells through large stockiest, distributors or sole-selling agents. Provision of customer service covering aspects such as delivery of goods, warranty administration, timely availability of repair and spares etc. performance of sales support activities such as monitoring distribution function, credit collection, improving manufacturer-dealer relations, implementing the promotional programmes, etc. In practice, the complexity of the selling task actually Performed varies from company to company even under the above four categories. Merchandise Deliveries: The sales person, whose primary job is to deliver the product usually against routine orders-popularly called sales and delivery boys. Inside Order-taker: Working inside a store the primary job of such a sales person is to service the customer's request or suggest appropriate product to meet customer wants; such type of salespersons are popularly called retail salesman. Outside Order-taker: The salespersons engaged in the task of taking orders from the resellers. They normally do not use hard selling approach for making orders. Missionary Salesperson: The salesperson whose primary job is to educate, give product detailing, build goodwill or create primary demand for the product. Strictly speaking, missionary salespersons are not permitted to take orders. Sales Engineer: The salesperson who acts as a technical consultant to the client and as per the need helps him to design products or production system for the client. This type of salesperson is popularly called Technical Salesperson. Tangible Product Seller: The salesperson whose job is to sell tangible products such as furniture, appliances, automobiles, etc. The job involves abilities to persuade and convince the customer. Intangible Product Seller: Here the salesperson is associated with selling intangible products or services such as advertising services, insurance, education, etc., the common factor being difficulty in immediate demonstration of the perceived benefits of the product. This selling job requires perhaps the greatest degree of a creativity in the salesperson. Defining the Salesperson's job: The foregoing classification of the sales position into seven categories, on the basis of degree of creativity required in the performance of each job is only general in nature. Depending upon the organisational need, each company should clearly define what it expects from a salesperson in terms of the tasks to be performed by him. It should broadly specify how much of salesperson's time should be spent on developing new accounts versus servicing existing accounts, large accounts versus small accounts; bulk orders versus small orders; selling individual products versus selling the product line; selling old products versus selling new products; etc. Lack of clear definition regarding the selling tasks to be performed, often results in disproportionate spending of time between the tasks, as well as in imbalances in the goals achieved. To avoid this type of loss in productivity of the salesforce it is worth repeating that the job of the salesperson should be defined with sufficient specificity, so that he can use it as a guideline to keep himself in the right direction. Up to this point we were discussing the role of personal selling and the degree of creativity required in a salesperson to perform his task satisfactorily. Preparation: Before starting the selling job, a salesperson should make a valuable investment of time and resources to know the products he will be selling, know the customers (i.e. customer types, buying motives and buying process) to whom he will be selling; know the competitors against whom he will be selling, and finally know the philosophy, policies and range of products of his company, In short, he should be well equipped with the fundamentals of selling. Prospecting: This step of the selling process deals with locating and preparing a list of prospective customers. Prospects can be located through (1) identifying the potential of buying more in the existing customers, (2) recommendations of existing customers, (3) winning back lost customers, (4) attracting competitor's customers, (5) customers' information request from advertisement, (6) newspaper announcements, (7) public records, (8) directories like telephone, trade association etc., (9) other salesmen, (10) references from friends, neighbours and business associates, and (11) cold canvassing, that is, going from door-to-door. The located prospects should first be qualified broadly in terms of (i) whether they want the product and how intense their want is, (ii) whether they have the adequate purchasing power, and (iii) whether and who possesses the power or authorisation to purchase and spend the required money. The qualifying of prospects is the process of separating the prospects from the suspects. It is worth-mentioning here that the ability to prospect is the most essential ability of a successful salesperson. A good salesperson keeps examining, weeding out the already tapped prospects and updating his lists of prospects, and remains in constant search of new prospects. 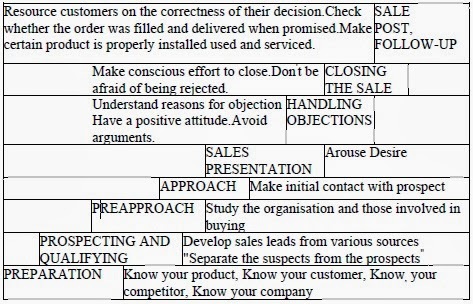 Pre-approach: The qualifying process of separating prospects from suspects further requires that the salesperson should possess detailed information relating to the prospects in terms of existing products consumed, their scale of operation, product range, their buying size, frequency, budget and the process, etc. In short, obtain customer orientation. The sources of information for the purpose include company annual reports, other salespersons, other suppliers to the prospects, census of manufacturers, professional journals, newspapers and market intelligence, The availability of the above information in as detailed a manner as possible will help the salesperson in ranking the prospect in terms of their priority to the company. Good salespersons use the above information in classifying the prospects in A, B and C categories in terms of the immediacy of the attention to be given to them. Approach: ‘First impression counts'. As such, this step needs to be carefully planned. This step has two distinct parts. One, of meeting the customer with a positive set of mind, and the second, is make an impact on him. For the former, referrals of reliable persons known to prospects, canine after fixing an appointment, use of door openers, help. For the latter the salesperson should equip himself with the key benefit to be emphasised, samples or new literature to be handed over, etc. Sales Presentation: Through advance information relating to the prospect every effort should be made to match the product offered to the needs/problems faced by the customer. The sales presentation should generally go according to the AIDA-Attention, Interest, Desire, and Action approach. How can this be done? Use of key benefit or a problem solver, or a unique act of the salesperson results in gaining attention. When used attentively this part also provides opportunity to get the main point of the initial statements made by the prospect. The presentation should proceed in a straightforward manner to help the prospect know that you understand his problem and that is the reason of your being there. To convince the prospect as early as possible, the salesperson should offer evidence through demonstration of the product, use of exhibits, models, sharing Of acts, citing examples of its successful applications/usage, showing testimonials, etc. The overall approach should be to build credibility and confidence in the supplying company, its products, and also in its competence to render specialised type of service to the, complete satisfaction of its customers. The flexibility of the sales presentations can range from the ‘Canned' or previously prepared presentation, to those allowing the salesperson complete freedom in the 'presentation. Though both the extremes, or even the hybrid of the two, have their own situational suitability, the important point to note is that salesmanship, being a showmanship function, must arouse active participation of the prospect in the presentation process. This can be done by introducing some action which would keep the prospect captivated. One possible way would be a joint review of the problem faced by the prospect. Another is helping the prospect imagine the projected benefits of owning the product. Handling Objections: It is in the last phase of the sates presentation step that the prospects start expressing doubts, or raising objections whether relating to price, need for more time to think, satisfied with the existing product/supplier or product quality claims. These doubts or objections should be welcome and they should be answered with confidence. There is certainly no doubt that the prospect has to be thoroughly, convinced that the product would satisfy his need. The ability of the salesperson of mind reading of the prospects, enables him to anticipate the prospect's objections and reactions. (1) welcome the objection and show respect to the prospect, and (2) do not argue with the prospect. Even when the objections raised are half-backed or trivial in nature, the salesperson should handle the situation tactfully. Only in extreme necessity, should a salesperson ask the prospect to adequately explain his problem faced. Even under these circumstances courtesy should not be lost sight of, and while the discussion is on, the salesperson should start recounting the benefits of the product agreed upon, and lead the prospect to make a favourable decision. It should be remembered that handling objections sharpens the selling skills of the salespersons. Closing the Sale: Closing is that aspect of the selling process in which the salesperson asks the prospect to buy the product. There is a critical point during each presentation when the salesperson should ask for the order. Pending the location of the critical point, as the objections are being met, the salesperson should help reduce the choice of options, summarise the benefits of buying, and the consequences of not buying, and if need be, make use of the big idea appeal of buying ‘now' at that moment. The salesperson should have the ability of catching the buying signals given by the prospect and should act on them fast. Some such signals are changing the sitting/standing position and moving closer to the product; reading the instructions on the product; perusing the testimonials; showing hesitation in being able to afford; asking for another demonstration, if applicable; checking the warranty or asking questions relating to warranty terms. These signals show that the time is ripe to start taking the order. Post-sale Follow-up: The selling process does not come to an end by writing the order. A few repetitions reassuring the benefits of the product keep the customer sold. Follow-up provides an opportunity to ensure that the product is being rightly used, and if necessary to re-explain the method of using, handling, and storing of the product when not in use. This builds favourable feelings and nurtures strong buyer-seller relationships. Post-sale follow-up not only reinforces the customer's confidence in the salesperson and his company but also tends to keep competition out. This also helps generate repeat business and valuable word-of-mouth publicity. The follow-up is a good source of feedback too. Let us conclude this section by stating that although the eight steps of the selling process are essential in spirit, these may not always be followed. This could be partly the (1) the selling situation involved (e.g., in the case of insider order-taker or retail salesperson) the first three steps of the selling process are generally not applicable as the customer walks into the store for buying a product, (2) the expertise of the salesperson (such that he can ignore or assume some information), or (3) the seller's market of the product where customers generally queue up for the product. 1. The more closely matched the physical, social and personal characteristics of the customer and salesperson, the more likely is the sale. 2. The more believable and trustworthy the customer perceives a salesperson to be, the more likely is the sale. 3. The more persuadable a customer is, the more likely is a sale. 4. The more a salesperson can make prospective buyers view themselves favourably, the more likely a sale is.